School books Auction - Includes Small World Royal Bonus. AT-43 Added! Thank you all for bidding, I'll be sending PMs to all the winning bidders with links to the BGG marketplace today and tomorrow. Blah blah blah, I need school books, and you're here for the Small World Royal Bonus. I thought to sell this on Ebay, but I'd prefer BGG gets its cut. Please bid in whole dollar amounts. Conditions of items as listed, buyer pays shipping. I prefer payment through Paypal. International bidders welcome, but please contact me regarding shipping prior to bidding, as international shipping is often prohibitively expensive. I'll end this auction by Wednesday night/Thursday morning of next week (September 25 or 26th), and at a random time to prevent sniping. I may add a few other items as I reorganize my game shelves. *Edit: To add preferred payment method, and add new items. New in shrink, this is a Kickstarter exclusive. I grabbed an extra one, but "The Jaguar" (ie, school) demands blood. If bidding goes above $40, I'll cover shipping within the Continental US, and be extremely grateful. A sealed Booster box of Rage CCG cards (Unlimited edition). Personally one of my favorite CCGs, I move and discover I've got a box of these sitting around. If you're new to this game, this should be enough cards for two people to start playing. Opened and played once, Like New. Everything present. This box is big, but I'll get you the best deal I can via USPS. If you don't want the box, I can ditch the box and try to secure the figures/terrain items/etc., and ship it all in a smaller box. 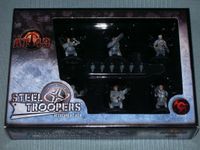 Steel Troopers Unit Box, New, never opened. 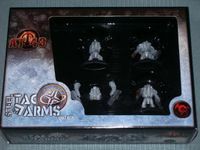 Steel Tac Arms Unit box. New, never opened, though some of the arm bits are rolling around in the box. Jam Tac Arms Unit box. New, never opened, though two of the units fell free from their spaces, and are currently "hugging." Please note, one of these is a UNIT box, this is the ATTACHMENT box. I don't know a ton about this game, but these units are clearly different. These appear to have larger weapons. Lieutenant G. Epstone Hero Box. Condition: Either Like new or New. I may have flipped through these, but the binding is unbent, and barring some very minor scuffing on the edges, these books look untouched.